University of Illinois Press, 1995. Hardcover. Acceptable. Disclaimer:A readable copy. All pages are intact, and the cover is intact. Pages can include considerable notes-in pen or highlighter-but the notes cannot obscure the text. An ex-library book and may have standard library stamps and/or stickers. At ThriftBooks, our motto is: Read More, Spend Less.Dust jacket quality is not guaranteed. University of Illinois Press. Used - Very Good. Great condition for a used book! Minimal wear. Urbana: University of Illinois. Very Good in Very Good jacket Ex-Library. 8vo-over 7Â¾"-9Â¾" Book and jacket are in very good condition. clean, tight and square. usual library markings. ffp neatly removed. in protective mylar. . Good. Hardcover. 1995. Baltimore, Maryland, U.S.A.: Univ of Illinois Press, 1995. Minor edgewear, bumped corners. Binding tight, pages unmarked. Black & white photographs. 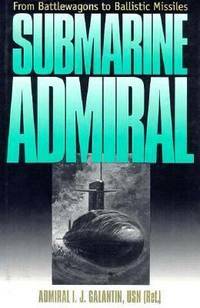 First American Edition.. Hard Cover. Very Good/Near Fine. University of Illinois Press, 1995-06-01. Hardcover. Good. University of Illinois Press. Hardcover. 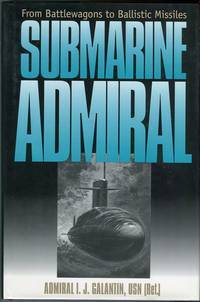 0252021606 First Edition 5 4 3 2 1. DJ is Very Good with minimal wear. Book is Near Fine with no markings, binding solid, no lean. Corners not bumped. . Very Good. University of Illinois Press. Fine in Fine dust jacket. 1995. First Edition; First Printing. Hard Cover. 0252021606 . Tight, clean and crisp. A gently read book in excellent condition. No inscriptions. No remainder mark. Not price clipped. Not ex-library. As New. ; 9.32 X 6.26 X 1.33 inches; 345 pages . University of illinois press, 1995. Very Good+/Very Good+. Hardcover: Dark blue cloth binding with title in silver on spine. Dark blue endpapers are spotless. 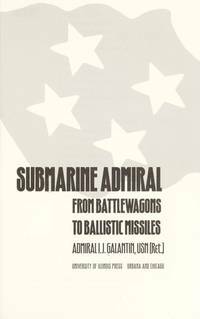 Title page and text pages are crisp and clean.This personal memoir tells the story of the amazing evolution of the submarine from its earliest days in the American Revolution to todays post-war Nuclear subs. Illustrated. Nice tight binding. Jacket: Excellent condition. Illustrated front and back covers. Very attractive copy in protective mylar. . ISBN: 0-252-02160-6. Fine in Fine dust jacket. First Edition. Hardcover; First Printing. ...; . . Hardcover. University of Illinois Press, 1995. 1st Edition/1st Printing. Fine Book in Fine Dust Jacket. Overall, a clean and tight copy to add to a collection or read and enjoy. Dust Jacket protected with a new archival cover. Bubble wrapped and shipped promptly in a box. .
University of Illinois Press, 6/1/1995. Hardcover. New. Hardcover and dust jacket. Fine binding and cover. Clean, unmarked pages. Ships daily. 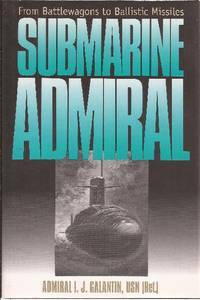 Submarine Admiral: From Battlewagons to Ballistic Missiles. Univ. Illinois, 1995., 1995. 1st ed. 345p. Photos. Notes on fly leaf . About 4 pages with marginal notes. Near Fine/Fine copy. First Edition. Hardback. Near Fine/Fine. Book. University of Illinois Press. Hardcover. 0252021606 Like New Condition. . Fine. University of Illinois Press, 1995-06-01. Hardcover. Used:Good.